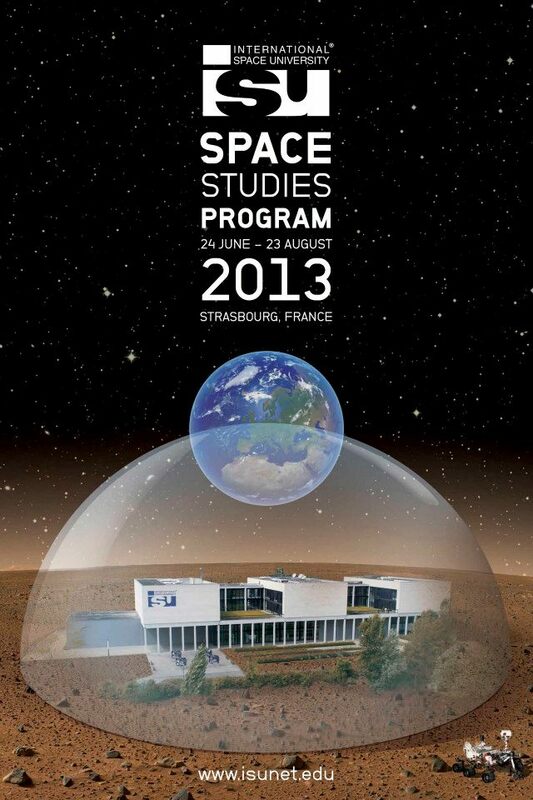 In 2013, I participated in the International Space University (ISU) Space Studies Programme (SSP) in Strasbourg, France. See my ISU blog posts here. 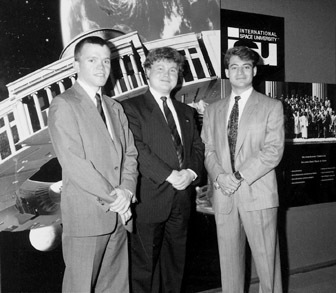 ISU founders: Peter H. Diamandis, Todd B. Hawley, Robert D. Richards on 12 April 1995. Credit: International Space University. ISU was founded as an international institution of higher learning, dedicated to the development of outer space for peaceful purposes through international and multidisciplinary education and research programs (ISU Bylaws, Article 2.1). It is a not-for-profit interdisciplinary university founded in 1987 that offers Master of Science in Space Studies (MSS), Master of Science in Space Management (MSM), and Executive Master of Business Administration (EMBA) degrees. These are in addition to the flagship Space Studies Program (SSP), a professional development program that has convened annually every summer since 1988 at various locations around the world. The International Space University Central Campus and global headquarters are located in Illkirch-Graffenstaden near Strasbourg, France. ISU was founded on the “3-Is” philosophy providing an Interdisciplinary, Intercultural, and International environment for educating and training space professionals and post-graduate students. As of August 2012, there were over 3500 ISU alumni from more than 100 countries. The Space Studies Program (SSP) is an intense nine-week course for postgraduate students and professionals of all disciplines. The curriculum covers the principal space related fields, both non-technical and technical and ranges from policy and law, business and management and humanities to life sciences, engineering, physical sciences and space applications. The shared experience of an international, interactive working environment is an ideal networking forum leading to the creation of an extensive, international, multidisciplinary professional network. Team Projects in which the SSP participants address a relevant space topic as an international, interdisciplinary, and intercultural team. For further information, see the SSP13 homepage. Many thanks to my sponsors – UK Space Agency and European Space Agency for making this possible. The UK Space Agency is an executive agency of the Government of the United Kingdom, responsible for the United Kingdom’s civil space programme. It is responsible for government policy and key budgets for space exploration, and represents the United Kingdom in all negotiations on space matters. It “[brings] together all UK civil space activities under one single management”. Its headquarters is in Swindon, Wiltshire. ESA is an international organisation with 20 Member States*. By coordinating the financial and intellectual resources of its members, it can undertake programmes and activities far beyond the scope of any single European country. *Austria, Belgium, Czech Republic, Denmark, Finland, France, Germany, Greece, Ireland, Italy, Luxembourg, the Netherlands, Norway, Portugal, Romania, Spain, Sweden, Switzerland and the United Kingdom. Canada takes part in some projects under a Cooperation agreement. Poland exchanged Accession Agreements with ESA in September 2012 to become ESA’s 20th Member State. Hungary, Estonia and Slovenia are ‘European Cooperating States’. Other countries have signed cooperation agreements with ESA.